A heart works tirelessly over a lifetime. During an average life span, the heart beats three billion times without a single break. Not bad for a muscle the size of a fist and lighter than a couple of baseballs. What’s the point of all this hard labor? The biggest point of all: life itself. 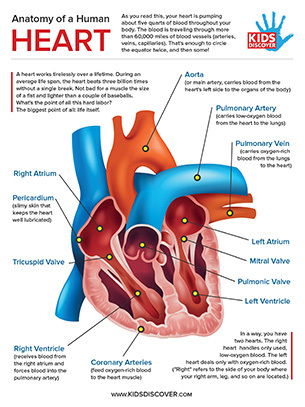 Download this informative one-page lesson sheet detailing the anatomy of the human heart, perfect for any science curriculum or human body lesson.